Drop in at the Pier Market, for just anything you can think off! Resort wear, swim wear and foot wear by Tommy Bahama ? For the Ladies who delight in Sunny and Chic, we proudly carry Lilly Pulitzer ?. outfits we carry. Not to forget, Lilly Pulitzer? also has Mom and Daughter matching outfits for girls ages 2-12. Should you be looking for sunglasses by Maui Jim or the Seaside Jewelry collection by Rhode Island based designer John Madeiros ? 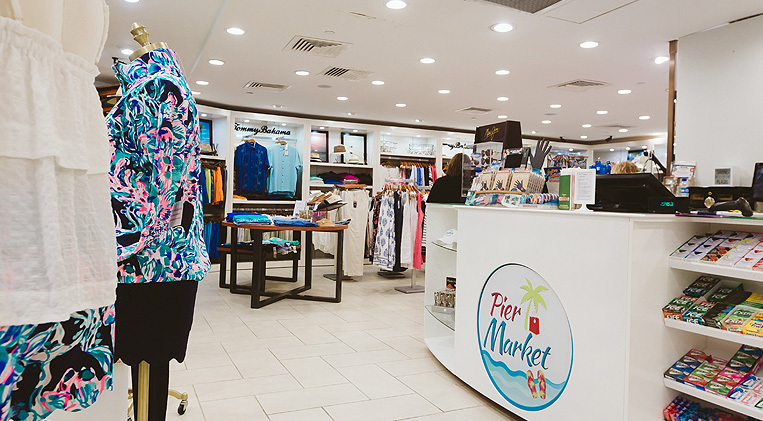 drop in and visit us.Pier Market also has ladies resort wear by Gretchen Scott?, unique gifts & collectibles, island souvenirs & T-shirts, flip-flops, water shoes, beach towels, cosmetics, sun-hair-body products and first-aid needs, OR snacks, beverages and spirits, candies, chocolates, cigars & cigarettes, cell phone accessories, postcards and stamps, we have it?